Students at Pearl Cohn H.S. navigate the Opportunity Now web portal for the first time. 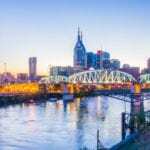 NASHVILLE, TN –Mayor Megan Barry announced the launch of a web portal designed to help young people find jobs and paid internships. The mayor addressed a mixed crowd of city officials, teachers, and students at Pearl Cohn High School. “For some of you this may be your first job. This is an opportunity for you to learn what it’s like to work with a team, to show up on time, to have the opportunity to use your skills.,” Barry said. The mayor said the Opportunity Now job portal grew out of a program last summer to reduce youth violence in the city. Barry asked Juvenile Judge Sheila Calloway and Criminal Court Clerk Howard Gentry to co-chair that initiative. The portal is easy to use and navigate. Once a student has uploaded a resume, they can peruse 7,500 jobs listed in about a dozen industries and then apply for work. The goal is to get 10,000 jobs listed by the end of the school year. “It will only work if you sign on to the portal and find those jobs,” said Ellen Zinkiewicz, Director of Youth and Community services at the Nashville Career Advancement Center. Zinkiewicz said the portal offers more than just a way to see what’s available and apply for jobs. Her center offers the Experience Works program that provides project-based work with a team of peers. There is a high school internship program and the career exploration program focuses on job readiness and financial literacy. The Summer Plus program is for graduated seniors to gain work experience and to help get ready for college. All of the opportunities are paid. Neymar Ortiz is a senior at Pearl Cohn. She will major in psychology at Trevecca Nazarene University next fall. Jacob Graham, also a senior, is college bound and wants to be a teacher. He sits down at a computer and logs on to the portal. “I’ve already uploaded my resume and entered all of my information,” he says. Graham begins by drawing a circle around Nashville with his mouse. The program finds all the jobs available in the category he has selected within the circle he has drawn. Clicking on on the icons within the circle brings the job information onto the screen. It is a lot easier than leafing through the want ads. But there are no school jobs open for summer and an advisor tells Graham to keep checking in for the next couple of weeks just to see if anything opens up. “If I can’t do education, I’ll probably pick public administration or stay in retail—but get a better-paying job in retail,” he said.